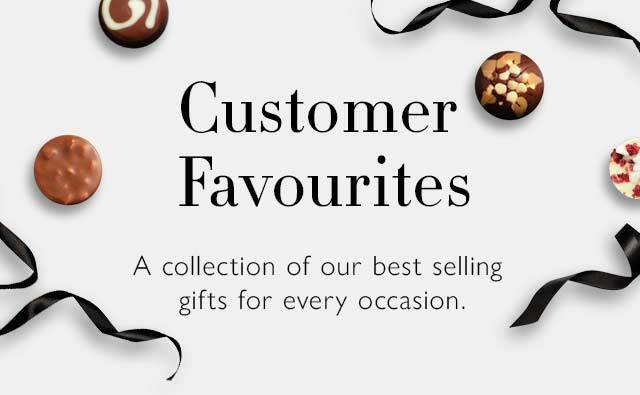 An elegant new box befitting our most delicious dark chocolate collection - all filled to thrill and dressed to impress. An elegant new box befitting our most delicious darks - all filled to thrill and dressed to impress.The cabinet is inspired by a dark wooden box with lots of little drawers, which lives in our chocolatier kitchen and keeps safe our working creations. We get a kick every time we open a drawer, and we hope this cabinet does the same for you. 575.00 g / 20.28 oz. Ingredients: Cocoa Solids (Cocoa Mass, Cocoa Butter), Sugar, Runny Caramel (Glucose Fructose Syrup, Sweetened Condensed Milk, Half Salted Butter (From Milk), Sugar, Salt, Emulsifier (Soya Lecithin), Water), Marzipan (Almonds, Sugar, Water, Invert Sugar Syrup, Neutral Alcohol), Full Cream Milk Powder, Hazelnut Paste, Stabilisers (Sorbitol, Glycerol), Butter Oil (From Milk), Hazelnuts, Glucose Syrup, Sweetened Hazelnut Paste (Hazelnuts, Sugar, Emulsifier (Sunflower Lecithin)), Whipping Cream (Cream (From Milk), Stabiliser (Carrageenan)), Ginger Pieces (Sulphites), Whisky, Port (Sulphites), Skimmed Milk Powder, Vegetable Oils (Palm, Rapeseed), Champagne (Sulphites), Dextrose, Emulsifier (Soya Lecithin, Sunflower Lecithin), Blackcurrant Concentrate, Gin, Cocoa Powder, Orange Liqueur, Neutral Alcohol, Natural Flavours (Vanilla, Blackcurrant), Milk Fat, Lime Puree, Caramelised Sugar, Water, Concentrated Whey (From Milk), Natural Colours (Beetroot, Carotene, Annatto, Anthocyanin, Paprika), Milk Protein, Acidity Regulator (Citric Acid), Sea Salt, Essential Oils (Lime, Lemon, Orange), Chilli Powder, Concentrate Of Spirulina. Dark Chocolate Contains Minimum 70% Cocoa Solids. Milk Chocolate Contains Minimum 50% Cocoa Solids, Minimum 20% Milk Solids. For Allergens See In Bold. May Contain Traces Of Tree Nuts, Peanuts, Soya, Milk, Gluten, Wheat.